My Green Pledge for January: To share more eco-tips with each of you on a regular basis. Don’t I already do this? My blogging habits have not been the healthiest and I often feel like my blog is messy and unorganized. Probably because that is my style and who I am. But I’m setting my own goal for January to become a more organized blogger and that begins with creating an editorial calendar! I have thought about this for over a year and I’m finally implementing it. Guess what? It doesn’t stop with writing it down either. I researched editorial calendars and I’ve printed one off – it’s sitting right in front of me! I even have January filled in with ideas and plans. I have so many ideas and plans that February is almost full too. I found a great article by Angela England about How to Use Editorial Calendars Effectively in Blogging. 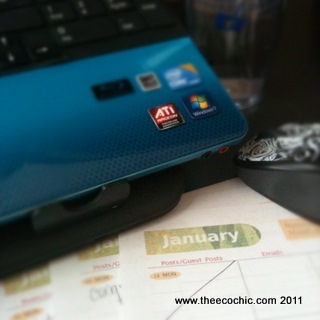 It was complete with links to a downloadable Editorial Calendar for 2012 (by Blog Energizer). Now to find the time to actually write everything I have on my calendar. Did you make the Pledge to Go Green yet? Did you finish step 1? What is your goal and what are your plans to achieve your goal? 6 Random Things from Modern Lime tout-est-des-roses Hide and Seek with The Eco Chic My Mommy is a Booger…I Mean Blogger! How to Go “No Poo” – You Tell Me Because I’m Clueless!